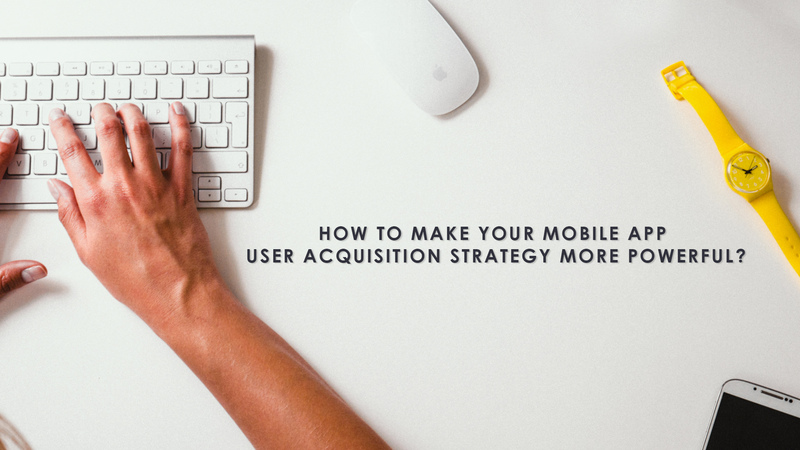 How To Make Your Mobile App User Acquisition Strategy More Powerful? The global app economy may have entered early maturity – but it is still a big-money sector. According to a recent App Annie report, total revenues from mobile applications will soar to $110 billion by the end of 2018 – with the annual growth rate hovering around the 18% mark for the next three years (till 2020). 1 out of every 4 iOS app developers make more than $5K every month – and around 16% of Android developers also have similarly high earnings. At first glance, the potential opportunities to make profits in the mobile app business seem immense. In the United States, a whopping 73% of smartphone users do not download more than 2 mobile apps in a month (~50% download none). In essence, your app will be vying to be one of these two apps for capturing the attention of the end-user – so that (s)he can be motivated enough to download it and give it a try. There is no way on earth to be successful in this if your software is not of optimal quality to start with. Create a great app, identify and highlight its USP(s), and make sure it delivers top-class user-end experience (UX). Only when if you are confident about your product, can you market it well. It’s been more than three years since the popularity of mobile apps went past that of mobile web (currently, the former is growing nearly 3X faster than the latter). That said, it is of paramount importance for every new application to have its very own, customized website. Make sure that the site is user-friendly, lists out all the key features/controls/benefits of the application, and has the store download link(s). Implement strong SEO practices to enhance the reach of your app website. It should also be linked as the ‘support portal’ of the app at the store. Presence of a dedicated app website is instrumental in building up a trust-factor with your audience – and that is vital for higher user acquisitions. On average, 6 out of every 10 downloads happen through search behaviour in the app stores. This, in turn, brings to light the importance of efficient app store optimization (strategies). Identify relevant keywords (avoid the ones with too much competition), and incorporate them smoothly (no stuffing) in the (max) 30-character app name, the (max) 170 character promotional text, and the product description section in Apple App Store. If you are working on the Android platform, optimize the 50-character app title, the 80-character short description and the 4000-character long description. Use HQ screenshots to showcase the most important screens/sections of your application. Create engaging and informative app preview videos. You have precious few seconds to get a person interested in your app – and the importance lies in ensuring a good first interaction with the app. Note: Over 74% of all featured apps at stores have keyword(s) in their titles. What does your app set out to do? Or better still, why is it in existence in the first place? If a professional app developer is not proactive about resolving such (very natural) queries in the minds of prospective users – the latter are simply not likely to feel any NEED to download a new application. Make apps that have a core functionality and solves an actual problem/requirement of end-users (fitness tracking, personal finance, social networking, and even gaming). Let people know why your application does a better job than other, similar apps already in existence. ‘Appeal optimization’ of an app is important – and it can be attained only when there is complete clarity over its purpose. A lazy, ‘me-too’ is bound to fail. A generic, ‘one-size-meets-all’ promotional strategy does not work well for most products, and mobile apps are not an exception. Identify the overall target audience for your new application – and divide this total user-base in different segments (on the basis of age, gender, geographical location, language preferences, etc.). Avoid making more than 3 such segments though – since too many user-groups can pose a problem for promotional strategy-making. Launch customized marketing campaigns for each of the target customer segments, to increase chances of positive responses. An app development company should ideally make use of information on user-behaviour on their previous applications, while designing a new software. Find out what features people liked and what they didn’t – and chalk out the operations of the new product accordingly. Be particularly careful about people’s reactions to in-app messages, push notifications, advertisements, and the like. If there are unfavourable reviews on a particular app, find out the main reason(s) for its unpopularity – and avoid making the same mistakes again. When it comes to maximizing the reach of a new application (basically, making as many people as possible AWARE about the app) – content marketing on the digital platform is a developer’s best friend. Start publishing short and informative blog posts and articles on popular online portals about your app, mentioning its objectives and features and the competitive advantages it delivers to final users. You can publish press releases (free or paid) as well, with the latest app-related news. Publishing classified ads is also an effective option. Keep in mind though, that the content you push out should not have an aggressively marketing tone (except, of course, the classified ads). The focus should be on seamlessly sharing information among likely users. Uber is one of the many apps that does this brilliantly. For every new user signed up, the person who had ‘referred’ him/her to the app (i.e., shared the referral code) gets a nice reward. Motivate your existing users to invite more people to the app – and offer something in return (hints, coins, level up, etc.) for doing so. Having a referral program right within a mobile application (and ideally, on the app website too) gives a lift to its engagement levels, and obviously, can build up the total user-count as well. 58% of the entire adult population in the US have active profiles on Facebook. The corresponding usage figure for Twitter is ~34%. What’s more, the global adoption figures of these two social networking channels are rising exponentially. In such a scenario, there is no way your app can survive without having a strong social media optimization (app SMO) plan. Publish posts on FB about your application, share images and screenshots, and tweet about it on a regular basis. Join relevant Facebook groups and post over there (avoid spamming though; a healthy, constant interaction is important), use hashtags on Twitter, and use channels like LinkedIn and Google Plus to get in touch with potential new users as well. Come up with ideas to make your posts more interesting and engaging (for instance, polls). Note: A mobile app should, of course, have its very own FB page and Twitter account handle. Yes, registering high download figures are important – but you can make it your only objective at your own peril. It might well happen that people like what your app has on offer, go ahead and download it, discover a serious snag in it, and discard it soon enough. That’s precisely why you need to carefully track the early set of user reviews and ratings coming in. If someone gives a lowly rating, try to understand what factor(s) have caused this behaviour – and how you can fix the problem. Respond to every review (even the 5-star ones). Remember, the opinions of the early adopters give you a fair idea of whether your app will be successful in the long-run or not. You create a mobile app that can be used by everyone – but then go ahead and release it in English only. Bit of a waste – since there are plenty of non-English speaking smartphone-users, and you are willingly passing up on the chance of reaching out to them with your app. Researches have shown that the download figures of an iPhone app can go up by as much as 760% by using proper, ‘localized’ keywords in different languages. Depending on the type of your app and its target audience – consider creating custom versions of it in other languages (e,g., French, Swedish, German, Russian, Korean, etc.). An app that has multi-language support automatically has higher user acquisition prospects. Note: The ‘Download On The App Store’ badge is available in 40 different languages. To promote a new mobile application, short video ads are mighty effective. On average, 30-second app advertisements have an impressive 88% completion rate – indicating that people do check out videos that pique their interests. App developers have to determine the best possible section to place such video-ads – in a manner that they deliver the relevant information without hampering the mobile-using experience of individuals in any way. Keep changing the video ads to keep things fresh – and avoid making videos that are over a minute long. Apart from these in-app ads (helping in cross-promotions), you can also create, upload and share longer videos – explaining the features of your app – on Youtube. Once your organic app marketing strategies are in place (and your budget allows for it), consider turning your attention to paid channels. You can start app ad campaigns on portals like Google and Facebook – to gain greater visibility and (hopefully) higher downloads. Design and link a proper landing page with the ads, so that people do not feel confused after clicking on the advertisements (i.e., there should be no barriers to conversion). There are several great mobile ad networks/paid acquisition channels in place (Flurry, AdMob and StartApp, to name a few) – and you can easily start to use a couple of these platforms to spread the word about your ad. Be careful about the expenses and the ROI on your ads at all times. It has been noted that 39% of users who see banner ads on mobile can actually recall them. Note: Interstitial ads are the way to go, if you wish to cut down on unwanted ad clicks. By the end of 2017, Behance had 10 million active users. In order to be successful, a mobile app needs to have the right mix of functional efficiency and visual appeal – and for the latter, showcasing designs on Behance is a preferred strategy among many app developers worldwide. Highlight the creativity that has gone into designing your software, display the most important screens, include animations, and add short, informative texts. Use tags wisely to gain greater visibility on the platform. Also, try getting your app featured in the curated galleries of Behance, for that extra leverage. Instagram and Pinterest are two other channels which you can use to visually market your product. Note: In all your messages to the prospective app users – blogs and PRs and videos and design/creativity platforms – convey a definite ‘message’ to the viewers or readers. Do not adopt an overtly sales tone everywhere. What if a person visits your app website, but does not download anything? In such cases, retargeting can be a useful method to ‘get back’ that prospective customer. The app website should have cookies (small internet files to ‘remember’ visitors) – which can be used to display retargeting ads to people. Find out at what time-intervals these ads should be shown, and make sure that people who have already downloaded your app are not shown the ads (that would be an irritation). Deep-linking in mobile apps is crucial for the success of mobile retargeting. Most mobile app developers make the mistake of tracking only the ‘installs’ and the ‘install rates’ of applications – and leave it at that. These metrics are obviously important – but more often than not – they provide an incomplete picture. To get a thorough idea about whether your acquisition/promotional strategies are performing as desired (or not! ), you also need to monitor other key performance indicators (KPIs), like cost-per-installs (CPI) or customer acquisition cost (CAC), app retention rates, and the lifetime value of applications (LTV). Keep in mind that tracking only the CPI is not a good idea either – since there is a trade-off involved between CPI and LTV (10% of users acquired by CPI have a <$10 LTV). If possible, use screen heatmaps to monitor the real-time behaviour of people while using your app. Make changes, if required, accordingly. Marketing emails often have a sub-10% ‘open rates’. However, if composed well and shared with the right people, that ‘open rate’ can jump to 35%+ – clearly indicating that email marketing can still be a handy app user acquisition strategy. Create an email template with a brief but informative introduction about your mobile application – and request for an online or telephonic follow-up, at the recipient’s convenience. It would be even better if you attach a powerpoint presentation with the email – presenting the USPs and features of your app. It would be too naive to hope for very high response rates – but you can definitely gain some customers through this channel. Note: If you can manage to connect with a key industry influencer and get your app promoted by him/her – that can be very helpful. Bad press can be the biggest app-killer out there. Actively seek opinions and feedback from your users – and find out the type of word-of-mouth (WOM) publicity that your app is garnering. If there are any perceived pain point(s) reported by these users, fix them as quickly as possible. Prior to launch, have a focus group (members should all be first-time users of the app) try a hand-on experience with your application. If a person is happy with your app, (s)he will recommend it to others as well – and your user-pool can start swelling quickly. On the other hand, if the WOM is poor…the consequences can be dire. A smartphone-user is just like any other regular shopper. He/she would love to get a feel of what your app does – before actually taking the trouble of installing it (if yours is a paid app, there is the question of justifying the expense too). Mobile app developers should ideally have a ‘play before pay’ strategy in place – providing users with live demos and previews of the app (Android Instant Apps have made this really easy). In general, consider providing limited access for free to first-time users, so that they can get an idea of the quality and benefits of your application. Once they are convinced that your app is a good ‘un, they will proceed to download it (free or not). The purpose of having a definite, well-rounded mobile app user acquisition strategy is to make your promotional campaigns ‘viral’. In an ideal scenario (where your app has indeed achieved the much-desired virality), every person should bring along more than one additional user for the app. Provide easily accessible options for registered users to send out invites to their contacts, and have strong social media integration (sharing) features. An app that goes viral can continue to move along on autopilot – constantly registering high download figures. A new app has to acquire close to 40000 new users in a day (i.e., have that many new daily installs) – for getting featured in the App Store. The challenge is big and the app marketplace is definitely overcrowded – but with the above tips, you can indeed take your user acquisition/marketing campaigns to the next level.